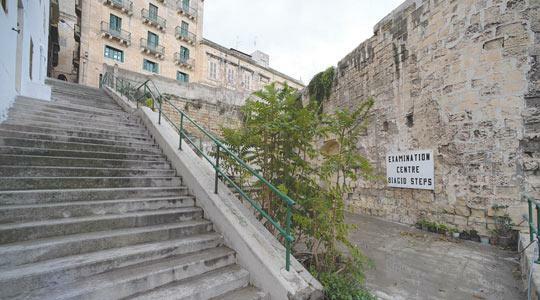 The rundown Biagio Steps Examination Centre, in Valletta, is to be transformed into an interactive fortifications museum. Rural Affairs Minister George Pullicino said the ministry had taken the initiative of setting up a museum dedicated to military architecture, which will be called Fortifications Information Centre. Stephen Spiteri, Superintendent of Fortifications, will be leading the project and providing all the information on the display items after conducting extensive research. "Malta's fortifications represent one of the finest collections of military architecture to be found anywhere in the world," Dr Spiteri said. The Biagio examination centre was designated to house the museum because of its location and vast interior spaces. It is central and provides direct access to Valletta's bastions, as well as excellent views of the Marsamxett harbour defences - namely Fort Manoel and Fort Tignè. Moreover, this project will provide an opportunity to rehabilitate the structure, which is in a bad state. The upper floor, which is level with Melita Street, was demolished during the World War II and never rebuilt. The plans for the museum have already been drawn up and the required permits applied for. The Ministry has calculated that the restoration and civil works necessary to rehabilitate the building will take place late next year. Internal works, together with furnishings and equipment, will then be in place sometime after this. The budget for the eventual museum should amount to some €300,000, a ministry spokesman said, although it was still premature to give an accurate figure of expenditure. The project will be entirely undertaken by the ministry. The design proposal for the museum was entrusted to the Restoration Unit, and Dr Spiteri said the cavernous vaulted interiors will provide an excellent exhibition space. The proposal will also use computer technology to create a unique experience combining rich multimedia and traditional displays. The present museum plans include six distinct areas: A permanent display focusing on the fortifications of the Hospitallers and the British; an audio-visual theatre; a resource and reference library; offices for administration and curators; a model makers' workshop and a retail/souvenir area. The permanent display will feature large scale models of Malta's fortifications, explanatory and multilingual interpretational panels, as well as interactive multimedia display points designed to explain the history and technicalities of military architecture to the public. The museum will also serve to showcase the Work Division's major projects of fortification restoration. A lift will link the Marsamxett area to upper Valletta and will be open to the public during the day to facilitate access to Melita Street from St Mark Street and the Valletta ring road.